Hi, my name is Jessica Bell. I am 29 years old, married and have two children aged 3 and 7 years. I live in Bluffdale, Salt Lake, Utah. I have red hair, but my husband does not. Neither do we think he is a carrier of the red-hair gene, since I’m the only one in the family that has naturally red hair. And the freckles that go with being ginger. I’ve traced back my family tree and hard though it is for some people to believe, I have no Irish ancestry. The inspiration for the ‘Ginger Idols’ blog came from reading about the sixteenth century flame-haired monarch, Queen Elizabeth I of England. Queen Elizabeth I never married, but her favourite consort was Robert Dudley, Earl of Leicester. Her friendship with Dudley lasted for more than thirty years, until his death. Historians can only speculate as to why Elizabeth didn’t marry and I find the mystery intriguing particularly since several foreign suitors were vying for Elizabeth’s hand. After the death of Dudley’s wife in 1560, Elizabeth seriously considered marrying Dudley for some time, though rumours the nobility would rise if the marriage took place may have put a halt to that. Elizabeth’s unmarried status inspired a cult of virginity. In poetry and portraiture, she was depicted as a virgin or a goddess or both, not as a normal woman. Would you ‘Adam and Eve’ it! From there I started looking into other famous redheads. Adam and Eve are both depicted in art with red hair, because the name Adam comes from the Hebrew word for red or reddish. Since Eve was created from Adam’s rib, she must have been a ginger too. So whilst scientists say that gingers like me have a genetic mutation (in the MC1R gene) that gives me auburn hair, it begs the question: Who is really the genetic mutation? That led to the launch of this blog. Here I will write about news, views and articles about all things ginger/redhead/carrot top/bluey etc. I will celebrate the celebrities with whom I share the genetic mutation and I hope it will a fun and interesting read. From Prince Harry to Vincent Van Gogh to Nicole Kidman, there are many notable people with natural red hair, which may be considered surprising with only 2 percent of the population having red hair. If you’re ginger, you have the rarest natural hair colour. Whilst rare, the red hair is a recessive trait, which means it only occurs when both parents carry the red hair gene. The parents don’t need to have red hair themselves, but if they carry the gene for it, there is a twenty-five percent chance their child will have red hair. 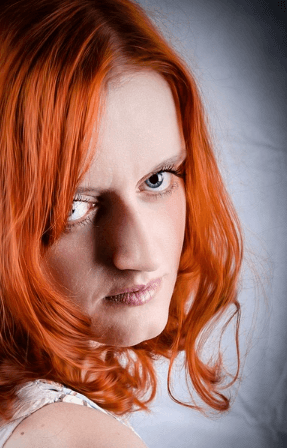 In Scotland, only 10 percent of the population actually has red hair, but 40 percent of the population carries the gene for it. So, we’re not going anywhere. (Two Weeks Notice); Faye Reagan (Compromise); Bryce Dallas Howard (Jurassic World); Bridget Regan (John Wick); Lily Cole (The Imaginarium of Doctor Parnassus); Amy Yasbeck (The Mask); Brigid Brannagh (Army Wives); Molly Parker (The Road) and scores more. I’ll be writing the biographies of celebrities and I’ll write what I find out about how their redness impacts on their lives. Do they ever get asked by strangers or acquaintances if they can play dot-to-dot with their freckles? Are they accused of having a fiery temper?